In addition to Andrewss fundraising support as a 21st Anniversary Ambassador for the Foundation, he also recently donated funds personally to make a number of wishes come true. Rameeza was one of those who benefited directly. 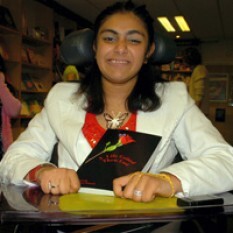 Rameeza, aged 18 from Manchester, has been ill for approximately 4 years with an undiagnosed form of dystonia. Rameezas wish was clear about the wish she wanted. “I’d like to have my poems put in a book and sold”. She has been writing poetry for several years and her poems reflect her experiences of living with a life-threatening illness. 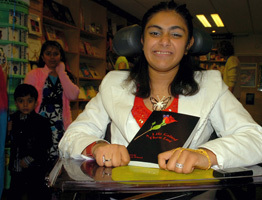 Make-A-Wish granted Rameezas wish on 25 June when her anthology of poems was launched at Blackwells University Bookshop in Manchester. She attended a specially organised book signing at the bookshop, where a selection of her poems was read aloud by her younger sister.